SA Rugby have announced the appointment of Paul Delport Head Coach for the Springbok Sevens following Renfred Dazel’s move to the Springbok men’s sevens coaching staff. 2018 is the most important year for South Africa since their relegation from the World Series in 2015. Since then they have suffered three years in the wilderness, thanks almost entirely due to the SARU and their ill-thought out agreement with the country’s Olympic Committee (SASCOC) that stopped them from playing at the 2016 Olympics, and as a result also prevented them from competing for a place in the 2016/17 World Series. 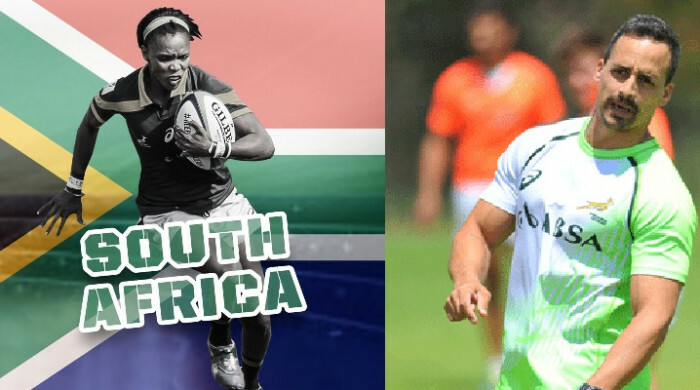 That exile comes to an end this year with the Springboks playing in two major international tournaments – the Commonwealth Games and the World Cup – while also having another chance to win back their World Series spot. Coach Renfred Dazel, who has coached the team since October 2013, has been the ley to holding the team together throughout these massive disappointments but he has now moved to the men’s team as assistant coach. He is being replaced by Paul Delport, a former South African men’s captain, who has been a SA Rugby Sevens Academy assistant coach in recent seasons. SA Rugby’s Director of Rugby, Rassie Erasmus, confirmed that Dazel’s move came after requests from the men’s team for additional support. “[The South African men’s coach] requested the appointment of an assistant coach a while ago and he and Renfred enjoyed a solid relationship over many years, so it will be an easy fit. Erasmus also said the elevation of Delport is well-deserved: “Paul has done really good work with the SA Rugby Sevens Academy team and has grown tremendously as a coach over the last couple of years. “He has worked with the Springbok Women’s Sevens before, so there is no issue with continuity in their set-up. They are playing at a tournament in Australia early next month [Brisbane 7s*] and will also be in action at the Commonwealth Games and Rugby Sevens World Cup later this year, so Paul will be busy in the next couple of months.